Friday 10th August will mark the 30th anniversary of the cult-classic Heathers. To celebrate the occasion, multiple cinemas are bringing it to their screens for the first time since the film’s original release in 1988/89. Heathers will be shown at The Mockingbird and The Electric Cinema on 10th August, with the start times ranging from 17:25 and 20:30 respectively. Tickets at The Mockingbird are priced at £5.70 or £8.70 (both including booking fee) for a ticket and a pint of MB lager. Further screenings will be held at The Mockingbird until 15th August, with Cineworld (Broad Street) screening Heathers for one night only on 16th August. Tickets to The Electric’s Heathers: 30th Anniversary ‘What’s Your Damage?’ party on 10th August start from £12.45 (including booking fee) for one of their limited availability standard tickets. At the time of writing, all but one of their back-seat sofas have sold out, with the three-person Dietrich sofa still available for £16.30. For direct event information, including film times, venue details, and online tickets sales, click here for Cineworld (Broad Street), click here for The Mockingbird, and click here for The Electric Cinema. 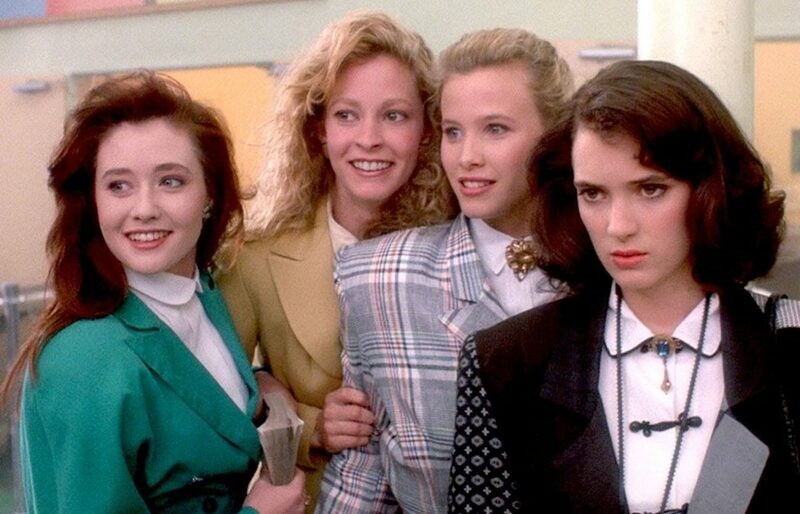 Despite opening to a lukewarm reception and a poor box office performance, Heathers grew to be the definition of a cult-classic and became ‘recognised as one of the high peaks of the teen movie genre’ since its original late ’80s release. Further to this, the film has spawned a modern-day remake in the form of a US anthology series – although the Paramount Network, the US production company who commissioned the series, has since dropped the project due to the content mirroring real life high school shootings in North America. But what is too close to home for the American smaller screen still made it to the stage, with a rock musical adaptation of Heathers having run regularly for the past four years throughout North America, Australia, and most recently the UK – moving from off the West End to the Theatre Royal Haymarket in September 2018. Heathers was directed by Michael Lehmann and depicts angst ridden teenager Veronica Sawyer (Winona Ryder) who is attempting to navigate Westerburg High School as part of the popular cliqué the Heathers – a trio of rich, elitist seventeen-year olds. Veronica soon begins to realise that the cost of popularity is at odds with her morals and that the group may not mark her true place in the high school social hierarchy. This, combined with the arrival of a mysterious (gun-wielding) outsider Jason ‘J.D’ Dean (Christian Slater), means the normalcy of Veronica’s life begins to take a sharp decline. After the two direct a seemingly harmless prank on cliqué leader Heather Chandler (Kim Walker), in response to her unrelenting nasty behaviour, they ‘accidentally’ end up poisoning her and at J.D.’s suggestion frame it as suicide. Veronica soon begins to realise J.D. isn’t the charming loner or idealist she first believed him to be, but a psychopath with an insatiable desire to eliminate all the popular students at Westerburg High – leaving Veronica in a race against time to stop him committing his most lethal act yet. What follows is quite simply a chaotic whirlwind of revenge, betrayal, more staged suicide, and numerous games of croquet. Notorious for its solid casting and a screenplay that has birthed multiple ‘classic’ quotes, Heathers offers a warped, satirical portrayal of the adolescent journey. The outrageous black comedy manages to offer a bleak and ‘off the wall’ approach to the classic teenage high school film, whilst still remaining undoubtedly entertaining and topical. Heathers screens at The Mockingbird and The Electric Cinema on Friday 10th August 2018 – and whilst The Electric’s Heathers: 30th Anniversary ‘What’s Your Damage?’ party event is a one off, The Mockingbird will be holding a total of five screenings with the last being on 15th August. Cineworld will be screening Heathers for one night only on 16th August. For direct event information, including venue details and online tickets, to visit The Mockingbird click here, to visit Cineworld click here, and to visit The Electric Cinema click here.